One of the most common areas I treat as a physical therapist is the hip. In fact, patients often complain of back or leg pain which is truly a result of hip dysfunction. It is easy to overlook how many structures cross the hip, how high our hip bones travel, and how intimately related the joint is to our pelvis and lumbar spine. Hip pain can range from sharp and intense to dull. achy, and omnipresent. The cause and thus symptoms of such an injury differ greatly from person to person, however, the common theme is that hip pain is one huge bummer. Although each individual's injury is truly unique, I tend to see some common themes in patient's who suffer from hip pain. If these tips help you, GREAT! If they do not fully resolve your symptoms, do yourself a favor and schedule an individualized assessment. Keep in mind that hip pain is NOT normal, and you don't have to live with it! Patients often tell me "oh, I have one leg that is longer than the other." Are you sure? Although it is possible for someone to have one leg with a femur that is actually longer than the other, it is unlikely. More often, muscles are tighter on one side or an individual stands in a asymmetrical posture which makes one leg seem longer. Do you have one leg that you typically like to stand on, and it just feels uncomfortable to lean on the other? Look down and see what that does to your pelvis. One side is up and one leg looks shorter, right? Over time, muscles on one side can become short and tight and the pelvis can begin to elevate, rotate or shift on one side. This puts the hip joint and the associated muscles in a different position compared to the opposite hip. I always make the point that there is a reason that one side begins to hurt verses the other...it's not just a coin flip! Determining that reason and addressing it is an essential component of recovery. Not to be dramatic or anything, but I believe that the psoas is the window to the soul. It is an epicenter for so many injuries that I have become somewhat obsessed with it. It has become one of my personal missions to teach others how to properly stretch the psoas. Why does a tight hip flexor, or psoas, matter? The psoas is able to flex the hip (as in bring your knee closer to your chest) but it is also able to rotate, side bend, and extend the spine because it attaches to the front portion of multiple vertebra. How crazy is that? So a stiff psoas can compress your hip joint, decrease hip range of motion, cause an un level pelvis, contribute to back pain, decrease nerve space....the list goes on and on. Who knew one little muscle could cause so much mayhem? The hip is a ball-and-socket joint, meaning that the head of your femur (the ball) sits in a cup-shaped portion of the pelvis called the acetabulum (the socket). This configuration gives the hip a ton of mobility, but also a lot of complexity. If muscles aren't working properly 360 degrees around the joint the ball can sit off-kilter in the socket and problems arise. One example of this would be a tight psoas, pulling the ball forward. Another would be weak or inactive gluteal muscles, pushing or allowing the ball to move forward inappropriately. Although strengthening glutes and learning how to fire them properly is a very generalized approach to treating hip pain, it often works! Check out this video from Garrett Mclaughlin for ideas on a basic hip strengthening program. All of our muscles have a normal "resting length", meaning the length the muscle prefers to exist at in order to contract strongly and perform optimally. Try jumping by just using your calf muscles. Keep your knees straight and hop up and down like you are jumping rope. Take note of how high you can bounce. Now try to do the same jumping exercise by starting on your tip toes, which is a shortened position for the calf. Stay on your tip toes and don't let your heel come down at all as you try to jump. Now how high can you go? Can you get off the ground at all without cheating? Here is where I swallow my pride and post pictures of myself running terribly in order to prove a point. I'd love to pretend that because I am a physical therapist I magically move perfectly, never get injured, and have perfect biomechanics. Shockingly...not the case. I've had a longstanding left hamstring and hip injury for over 2 years. Why the left side and not the right? As I said before there has to be a reason. Overuse injuries don't land on one side like the flip of a coin. Take a look at me when both feet are off of the ground. 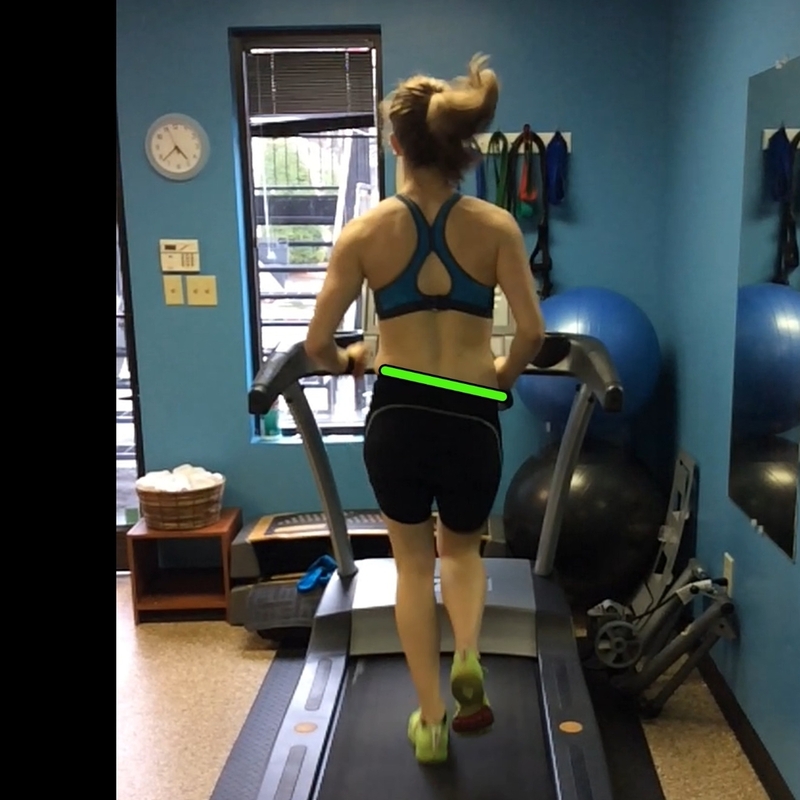 My hips are level left to right, which is the ideal position for running. When hips are level in this plane it minimizes the force that goes through our joins and soft tissues. When both feet are in the air, my hips are level from left to right. This is ideal. When I am in stance phase on my right leg, my hips still stay fairly level. Not perfect, but not too bad. This indicates that my right gluteal muscles are strong-ish and function properly. When I am in stance phase on the right, my hips stay mostly level. My right hip glutes and stabilizers are sufficiently strong and active. My left glutes and stabilizers are a hot mess. Yikes. Ouch and yuck. My left glutes just didn't want to get out of bed today. Can you see how this would stretch the outside of my left hip with every step? The inside of my left knee? Compress the outside of my left knee and stretch my IT band? Make my right leg have to bend further to swing through and not stub a toe? With every single step?!? Bleh. Just gross. Like I said, overuse injuries are never a coin flip. Have you struggled with hip pain, or just tried to live with it? Don't. Ain't nobody got time for that. Find out what's going on and what you can do about it. Knowledge is Power my friends.